Yes, ladies and gentlemen, that’s right: I’m taking a break from recent revelations that Volkswagen’s emissions figures offer approximately the same accuracy as a fortune cookie in order to bring you a story about collector vehicle license plates. Once I’ve finished, you may return to your regularly scheduled press conferences, where old German men stumble over themselves to insist they did nothing wrong. I also find this odd because a 1995 Saab 900 isn’t really that old, when you think about it. I mean, the damn thing doesn’t just have dual airbags. It probably has a CD player. It probably has power seats. It probably has leather upholstery. It probably has a better emissions profile than a TDI SportWagen. So I went home and I looked up the statute on historic motor vehicles in the District of Columbia, and I discovered the following: usually, a vehicle must be 25 years old to qualify for historic motor vehicle license plates. But if the automaker no longer exists, the vehicle can be a mere 15 years old and still qualify. 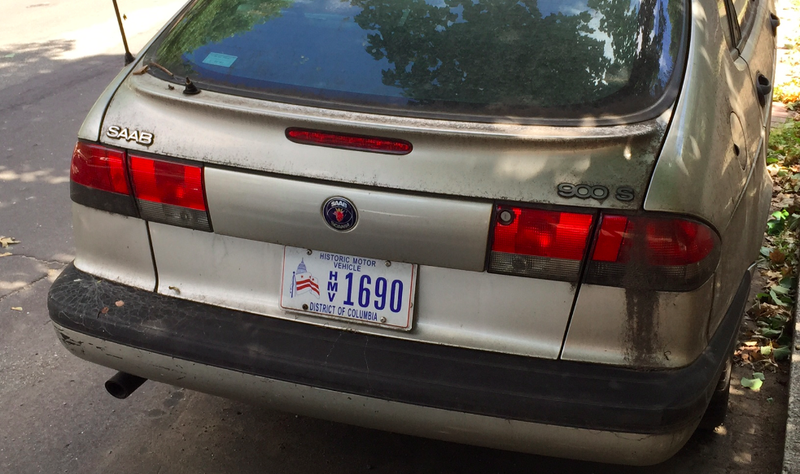 Yes, you’ve read that correctly: if you live in Washington, D.C., with a 15-year-old car whose manufacturer no longer exists, then you have a “historic motor vehicle.” A 2000 Saturn SL2? Historic motor vehicle. A 1999 Pontiac Montana? Historic motor vehicle. A 2000 Suzuki Esteem? Historic motor vehicle. You could walk right in to D.C. DMV offices tomorrow with the title to your 1997 Geo Metro and walk out with historic license plates. But D.C. is an exception, right? Surely, most states are nowhere near as lenient with their “historic motor vehicle” designations. To find out, I started going state to state and checking other statutes and laws. And this is where I discovered I don’t just feel like an old person. I am actually becoming one quite quickly. I’ll give you a few examples. D.C.’s neighboring state of Maryland says that a vehicle cannot be historic unless it is “more than 20 years old.” You know what’s 20 years old? The original Dodge Neon. In Maryland, that’s a collector vehicle. So is that Toyota Camry wagon with the two rear windshield wipers. The original Chevy Tahoe. The first few model years of the E36 BMW 3 Series. In Maryland, these are not just used vehicles. These are historic vehicles. Even in states where things are a little stricter, “collector vehicle” license plates are starting to find their way on to on cars that I don’t really consider to be all that old. For example: most states have a 25-year age limit on collector vehicles, which means that the original Ford Taurus and Lexus LS400 are now collector vehicles. It also means that beginning next year, the very first Ford Explorer will become a collector vehicle in most states. I still remember when my parents test-drove a new one of those back when I was a kid. Instead, they bought an Isuzu Rodeo, which, incidentally, is also becoming a collector vehicle next year. For those of you reading this outside the United States, you’re probably wondering what all the fuss is about. Who cares if you have a regular license plate, or one that says “historic” on it? you might be thinking. It’s all the same, right? Actually, not quite. In most U.S. states, the primary benefit of historic license plates is that you suddenly become exempt from many automotive requirements. For instance: in some U.S. states, a vehicle no longer has to undergo an annual safety inspection once it’s been deemed “historic.” That means beginning in just four months, you could take a sawzall to the roof of your ’91 Explorer, remove the seat belts, and cruise around on the beach in your fully legal “historic” vehicle. And here’s the kicker: most states also exempt historic vehicles from emissions requirements. This means you could take your freshly de-roofed Explorer, ditch the anemic 4.0-liter V6 Ford stuck in there back in 1991, and drop in a big block V8 with every single emissions component removed. Then you could go around, sun shining, V8 howling, spewing a cloud of unhealthy black smoke like you’re driving a Passat TDI. And I would observe from afar, watching my youth slowly slip away.